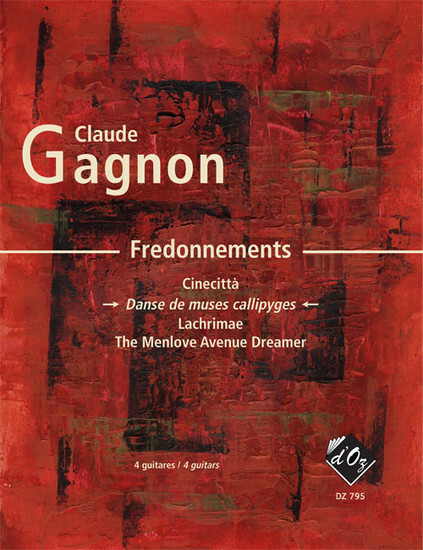 "DANSE DES MUSES CALLIPYGES is much more energetic with a 3,3,2 rasgueado in 8/8 time presaging a lively theme that is both Canarios-like yet modern. As the mood builds there is a dramatic and rhythmic section. The music moves on as if to reprise the opening section, but the rhythm is no longer 8/8 but rather a demanding mix of 8/8, 4/4, 9/8, 6/8 and 6/4, so cool heads are needed! The whole piece is repeated, so that this is also a long movement and fully capable of holding its own as a stand-alone piece. The part scores are laid out to minimize page turns. An interesting suite for the advanced intermediate quartet."